Today I will be asking about Xenoblade Chronicles 3D, which will exclusively be available for New Nintendo 3DS and New Nintendo 3DS XL. In the case of common RPGs, it’s not unusual for them to sell like hot cakes right after release, only for sales to decline soon after. However, when the original Xenoblade Chronicles1 for Wii was released five years ago in Japan, and because of the way the game was designed with an impressive attention-to-detail, word-of-mouth started to spread. 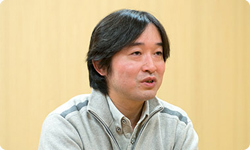 Now, Xenoblade Chronicles 3D is coming to New Nintendo 3DS and New Nintendo 3DS XL.So we’d like to ask Monolith Soft’s2 Takahashi-san just what type of game Xenoblade Chronicles is. Thanks for talking with us today, Takahashi-san.1. Xenoblade Chronicles: An RPG released for Wii in Europe during August 2011. 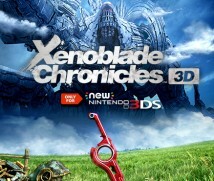 Xenoblade Chronicles 3D will be released for New Nintendo 3DS and New Nintendo 3DS XL in April 2015. It is not compatible with Nintendo 3DS, Nintendo 3DS XL or Nintendo 2DS.2. Monolith Soft: Monolith Software Inc.: A Japanese video game development company established in 1999. 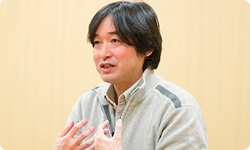 Developed the Xenosaga series, the Baten Kaitos series (Nintendo GameCube) and Disaster: Day of Crisis (Wii) among others. The main office is in Tokyo, Japan. First, could you look back a little on what you were imagining for the world of Xenoblade Chronicles when you started development for the Wii version? Of course. My first thought was that I wanted to build a masterpiece within the JRPG3 genre. So, while I worked towards completing the game, I carefully gathered all of the many elements necessary to make that happen.3. JRPG: A role-playing game created in Japan that often features turn-based combat. JRPG refers to Japanese-made RPGs, which have had a unique evolution in Japan. The term is used more often in other countries, but not so much in Japan. After the Wii version of Xenoblade Chronicles was released, it seemed that there were a lot of people saying, "The quality of Xenoblade Chronicles stands out amongst all the JRPGs released within the past few years. "So in that way, you can say that you succeeded in your goal, or should we say, ambition, of creating a masterpiece. People said things like, “I could stay in that world forever,” or “I don’t want it to end,” even though they’d been playing for over 100 hours4…4. Playing for over 100 hours: The Xenoblade Chronicles play-time counter stopped at 99 hours and 59 minutes, but Xenoblade Chronicles 3D will display up to 999 hours and 59 minutes. There’s no greater compliment, is there? When we made EarthBound5, it made me so happy to hear people saying, “I didn’t want it to end.” When you were making Xenoblade Chronicles, did you expect it would be so highly regarded?5. EarthBound: An RPG released for Super NES in Japan during August 1994, and first made available on Wii U Virtual Console in Europe in 2013. 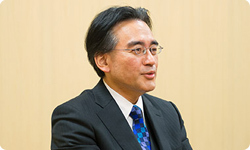 Satoru Iwata, who was the President of HAL Laboratory, Inc. at the time, was involved in program development. To be honest, we did anticipate that we would get a relatively strong response within Japan. So you must have had a solid feeling about its reception during development. Most western gamers like realistic games with high-definition graphics. Yes. They do seem to favour large-scale games that offer a lot of freedom. So I was surprised that users who were used to that type of game bought and played our game. So you didn’t know whether people who were used to playing that type of game would like a JRPG like Xenoblade Chronicles? That’s true – I thought they might be tired of JRPGs. Oh, I see. The JRPG genre was able to attract game fans all over the world in the 1990s, but after that, gamers in the west didn’t give soaring reviews to the genre like they did before, so you thought that they might not pick up Xenoblade Chronicles. But that didn’t turn out to be the case. It seemed that fans in the west felt they were finally seeing the evolution of JRPG. Why do you think that is? Looking back, I wonder if it satisfied a craving they had. Perhaps the 90s game fans felt that the “future of RPGs” they envisioned was never realised, but that your Xenoblade Chronicles offered them hope for the future of RPGs. That may be. And I think it was quite different from a game made in the west. One difference is that it did a good job of incorporating the innate heroism of JRPGs, allowing the user to become the hero, to become the protagonist. On the other hand, western games – and this is only my personal opinion – are very well made, down to the last detail, but there’s something stoic about them, and often the heroism aspect seems to take a bit of a back seat. The heroes of western-made games do often look very strong. But in JRPGs, the protagonists aren’t very strong. They seem like people you could meet on the street who just happen to be born to a certain destiny, and are drawn by some force into doing things that they could never have believed possible. But if westerners really didn’t like that kind of story, Stars Wars6 wouldn’t have become such a hit. Because that movie is just this type of story.6. Star Wars: A popular science fiction movie series by Lucasfilm. The first film, Episode IV: A New Hope, came out in 1977. That’s true. Also, I think the fact that I grew up in Japan’s unique comic-book culture had a big impact on the game. I was able to smoothly incorporate the appeal of comic books into the world of the game. Recently, Japanese comics have been quite popular in the west. That’s true. I think that people caught on to their appeal. Of course, I’ve also seen the strong reaction to Xenoblade Chronicles from people who love Japanese comics and anime. But that’s not the only appeal. There’s the impression that the people who enjoy the overall JRPG genre were overjoyed with the game. They seemed to feel like the next generation of JRPG had finally arrived. The overseas sales would never be higher than the Japanese sales unless that was the case. Since the topic of comic-book culture came up, may I go off on a tangent here and ask you what other cultural influences you have?